We all want comfort when it comes to dressing up, and this combination of a navy leather biker jacket and a Salvatore Ferragamo braided gancio bracelet is a wonderful example of that. Kick up the cool of your getup by wearing silver leather pumps. We're all ensembleing for comfort when it comes to dressing up, and this combination of a blue cable sweater and a Salvatore Ferragamo braided gancio bracelet is a vivid example of that. Rock a pair of black leather ankle boots to va-va-voom your outfit. Consider pairing a light blue tweed jacket with a Salvatore Ferragamo braided gancio bracelet if you're on a mission for an outfit idea for when you want to look casually cool. Opt for a pair of black leather mules to kick things up to the next level. If you're obsessed with functionality dressing when it comes to your personal style, you'll love this cute combination of a red plaid dress shirt and a Salvatore Ferragamo braided gancio bracelet. Sporting a pair of black suede ankle boots is an easy way to add some flair to your outfit. 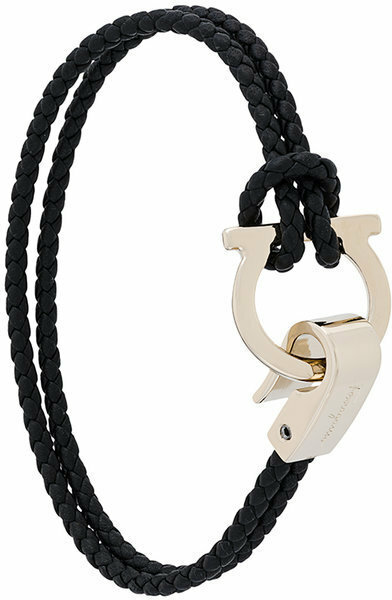 Consider teaming a black leather bomber jacket with a Salvatore Ferragamo braided gancio bracelet from farfetch.com for an unexpectedly cool ensemble. Wearing a pair of dark brown suede ankle boots is an easy way to add some flair to your ensemble. If you're a fan of relaxed dressing when it comes to your personal style, you'll love this extra cute pairing of a black crew-neck t-shirt and a Salvatore Ferragamo braided gancio bracelet. Rock a pair of hot pink athletic shoes for a more relaxed aesthetic. If you're a fan of comfort dressing when it comes to fashion, you'll love this totally chic pairing of a navy blazer and a Salvatore Ferragamo braided gancio bracelet from farfetch.com. If you're obsessed with relaxed dressing when it comes to fashion, you'll love this uber cute pairing of a white lace crew-neck t-shirt and a black leather bracelet. You could perhaps get a little creative in the shoe department and dress up your getup with tan leopard suede pumps. We all getup for comfort when it comes to dressing up, and this combination of a white dress shirt and a black leather bracelet is a vivid example of that. You could perhaps get a little creative when it comes to footwear and spruce up your ensemble with black leather ankle boots.